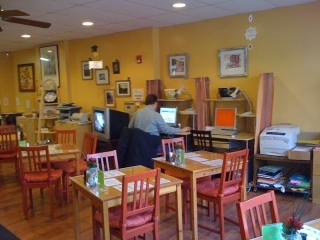 If you are familiar with Sweet Bytes Internet Cafe then you may be wondering what this Grand Re-Opening is all about. Yes, Sweet Bytes has been consistently pumping out delicious home cooked, comfort cuisine for several years now, but recently owners, Donna Mitchell and Lorraine Cuffey, have decided to take a new path. 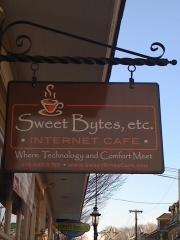 Their new venture, which officially kicks off February 1st, is Sweet Bytes Internet Cafe & Bakery. Yes, you heard me right, BAKERY! This is very exciting news as Ambler has been without a bakery for going on twenty years now. Locals undoubtedly remember Geotner’s Bakery on Butler Avenue, it was a sad day when they closed their doors. I’ve heard it said that a bakery is the heart of a small town, so it looks like we’re getting our heart back! The initial focus will be on French and Italian pastries, cinnamon buns, cobblers, pies and Sweet Bytes’ signature cookies and cupcakes, all of which will be baked on premises. After measuring the response they will most likely add bagels, donuts and the like to the existing selection. During this transition Sweet Bytes will phase out dinner service and change their hours accordingly, they will still serve breakfast and lunch. For those of you who are in a panic right now, rest assured, Lorraine will still have her famous mac & cheese available. Sweet Bytes will be open Tuesday – Friday, 7am – 3pm, and serve an abridged hot breakfast, full lunch and a full line of baked goods. Saturday and Sunday they will serve their full breakfast menu, an abridged lunch and of course, all baked goods as well, 10am – 2pm. As I mentioned, the new bakery officially opens February 1st, but do not miss the Grand Re-Opening on Saturday January 22, 9am – 2pm. This is your chance to taste the new baked treats for FREE! If you can’t make it to the grand re-opening be sure to stop in to Sweet Bytes soon; it is a quaint cafe with feel good food where you instantly feel right at home, Donna and Lorraine make sure of that! This entry was posted on Wednesday, January 12th, 2011 at 11:27 am and is filed under Ambler, Events. You can follow any responses to this entry through the RSS 2.0 feed. Both comments and pings are currently closed. If the baked goods are half as good as all their other offerings, Ambler is indeed a lucky town! I can’t wait! !